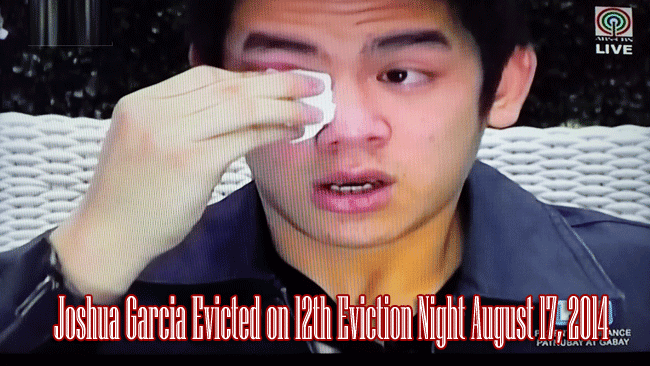 Joshua Garcia dubbed as "Tatay's Boy ng Batangas," Evicted from PBB All In 12th Eviction Night August 17, 2014 by garnering the smallest number of votes. Joshua was included on the nominated including Jane at Daniel. There are only one week left for the Pinoy Big Brother All In before its conclusion. 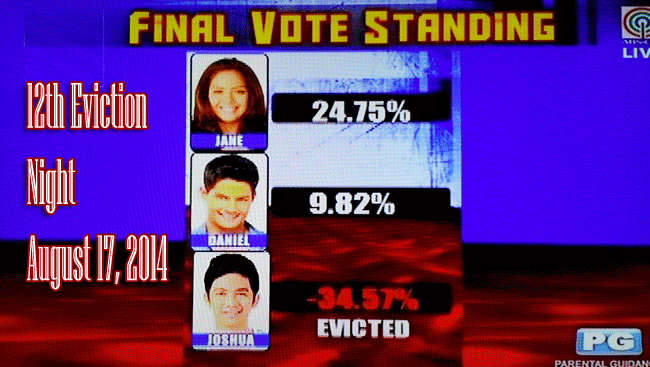 During the eviction night, the nominated housemates were nervous of the result. Joshua immediately cried when they heard Toni Gonzaga’s voice telling Daniel as safe for the eviction. Then came the time when it was either he or Jane will be evicted. When the name of Jane was called to be safe for eviction, Joshua was emotional. He hugged everyone inside the house and the last hug was given to Loisa. Loisa and Jane were so emotional during that time. When Joshua went out of the house, he was accompanied by his father. The hosts asked him if who among the remaining five housemates was his Big winner, he was not able to answer, instead, he said that they have to prove something or do their best in order to be considered as the Big Winner. Joshua was the seventh housemate who entered the Big Brother House was Joshua Garcia. He is dubbed as "Tatay's Boy ng Batangas," and introduced on Sunday. Joshua at his young age would like to prove that being young has the capacity to become an influence to others just like what he is about to do inside the Big Brother House. One thing about Joshua is that he came from a broken family. His parents separated when he was still a kid, in fact, he grew up with his uncle. Due to financial problem and lack of means to go to school, he stopped schooling. The best thing that happened to his life now is his reuniting with his dad. And he is also dedicated to finish his studies and support his family someday. For the record, his uncle was a priest and surely, Joshua learned a lot of ideals and good moral character from him. Now, the big question is.. Who will be The BIG 4 of PBB All In? Vote for your bet now.